My interest in paint began during a visit to the Scotland Yard crime lab in London. They were working at the time on a burglary case in which someone pried open a window, entered a house, and robbed it. A suspect was arrested and found (as occurs often in such cases) to have a small chip of paint in the corner of his shirt pocket. When I looked at the paint under a microscope, I saw four layers of paint: a thick green layer, a yellow layer, and two distinct white layers of different thickness. The paint-pattern was identical to the paint on the window of the burglarized home. It was like a “paint-fingerprint,” and it served later, I was told, to convict the suspect. I recall wondering at the time how paint analysis was used in art forgeries, and given below are a few things I found out. 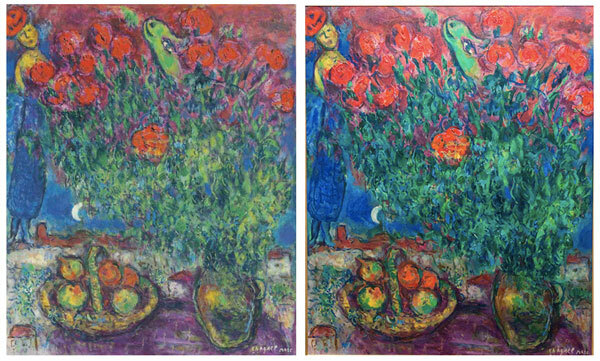 In 2011 Wolfgang Beltracchi was sentenced in Germany to several years imprisonment for forging a large collection of paintings in the style, and with the signatures, of great artists such Picasso and Monet. Paintings by the masters are worth multi-millions of dollars, so that selling well-crafted imitations can be a very profitable although highly illegal business. Beltracchi was an expert forger who took great care to make his fakes look authentic. Thus, he studied meticulously the painters he copied by going to museums where their work was displayed. He even visited the homes of the artists in order to learn their mindset. Beltracchi was able to paint with his right hand or left hand, depending upon the handedness of the artist he was copying. Brush strokes were not to betray him! Fake labels on the backs of old paintings were attached using a homemade glue of bone and other natural materials. He also was careful to use paints that were prevalent at the time of the artist’s life, but it is here where he made a fatal error. At one point Beltracchi was attempting to copy the style of artist Heinrich Campendouk (1889 - 1957) who used zinc oxide for a white pigment. Beltracchi also used zinc oxide in his forgery but, unknown to him, his paint had been manufactured with a trace of titanium dioxide contamination. Simple chemical analysis of a chip of paint from the forgery exposed the fraud. Released early from prison after only four years, he was asked by a reporter if he could guarantee never to do this again. He replied, laughingly, that one thing was certain, he would not again use paint with titanium. A successful forger must himself be an artist who can produce paintings good enough to fool the experts. This takes a bit of genius. The forger is also faced with the problem of selling the forgery. This usually involves creating a fake “provenance” (or past history) of the painting. Here is how Beltracchi did it: He collaborated with two granddaughters of Werner Yaeger, a wealthy industrialist. These women lied and claimed they had inherited the paintings from their grandfather, who in turn had ostensibly bought them from a prominent art dealer, Alfred Flechtheim. Counterfeit Flechtheim labels were attached to the back of the paintings. A highly respected art expert, Werner Spies, was fooled by all this false information, and he issued certificates of authenticity that made it easy to sell the paintings. In another case, the forger painted a picture in 1962 that he claimed was the creation of a well-known artist earlier in the century. Upon close inspection, an art-investigator found a single polypropylene fiber embedded in the paint. The fiber had not been commercially available to the public until 1958. Case closed. Forgery goes back centuries. In 1496 Michelangelo (of St. Peter’s Basilica fame) sculptured a marble statue (a sleeping cupid), partially broke it, buried it to make it appear ancient, and sold it as an antiquity. In the early 1900s, art dealers would test the authenticity of a painting by rubbing alcohol on the paint, and then poking it with a hot needle. New paint can be punctured much more easily than older paint. Some forgers, aware of this test, mixed Bakelite, a hard plastic, into the paint. Other methods of deceit include using a special baking process to simulate the network of fine cracks (called “craquelure”) that cover paintings of the old masters. Experts, however, can tell the difference between artificial cracks, which are rather uniform in appearance, and genuine craquelure that has irregular patterns. F614 was the name given to a self-portrait of Vincent van Gogh that was brought to Marie-Claude Corbeil, a chemist at the Canadian Conservation Institute, for authentication using X-ray analysis. It was known from letters written by van Gogh that he used an “asymmetrical” canvas, i.e. one that had different number of horizontal and vertical threads. Although the threads do not block X-rays, the canvas was covered by a so-called priming layer (painted initially onto the canvas to make it smoother). This X-ray-visible layer is thicker in the open spaces between the threads than where the threads overlap. By this means the X-rays could detect the thread arrangement which was seen to have identical numbers in both directions. F614 was worthless. 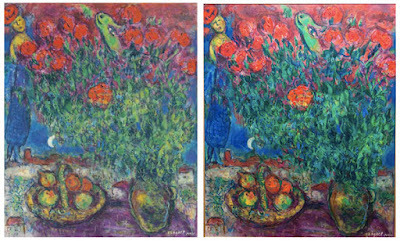 Ultraviolet and infrared spectroscopy, atomic absorption, and microscopy have all been used to track down art forgeries. The case of Ely Sakhai is worth telling. He would buy a little-known painting from a famous artist, make a copy, and then sell them both. The fake was sold in Asia, the real painting in New York or London. His operation earned him $3.5 million according to the FBI. Unfortunately for Sakhai, an owner of a fake painting in Tokyo, and an owner of the corresponding authentic painting in New York, decided to sell the paintings at the same time and at the same auction house. Because of this unlikely coincidence, the career of Mr. Sakhai ended abruptly. I will close this report with one last forger, a Mark Landis. He would arrive at a museum or church and introduce himself as Father Arthur Scott. He dressed the part, wearing black clothes, a clerical collar, and a Jesuit pin on his lapel. His purpose for the visit was to donate a small expertly faked painting in memory of this mother or other relative. Who would not accept such a gift? After all, the donor looked like someone you could trust; the painting appeared authentic; and (best of all) it was free. Over forty museums were approached by Landis, and many of them displayed the paintings as authentic works. Landis obviously did not operate the scam purely for money. He was apparently satisfied just by seeing his artistry accepted as authentic. It is even unclear that he broke any laws. In any case, when the paintings were eventually discovered to be forgeries, museums were alerted, and the FBI art-crime team was put on the case. But Mark Landis suddenly disappeared and has managed to evade arrest. Like many forgers, he was a person who merely wanted a little acceptance from the public. And he delighted in the incompetency of the so-called experts who regarded his work as originating from our great masters. One rather hopes that he is never caught. Meu interesse em pinturas começou durante uma visita que fiz ao laboratório de criminalística de Scotland Yard em Londres. Na época, eles estavam trabalhando em um caso de roubo, no qual alguém havia arrombado uma janela de uma casa e a assaltado. Um suspeito foi preso e encontraram no bolso de sua camisa um pequeno fragmento de tinta, fato muito comum em tais casos. Quando observei a pintura por um microscópio, vi quatro camadas de tinta: uma camada verde grossa, uma camada amarela e duas camadas brancas distintas e de diferentes espessuras. O padrão de tinta era idêntico ao da tinta da janela da casa assaltada. Era como uma “impressão digital de tinta”, e soube-se mais tarde que serviu para condenar o suspeito. Naquela ocasião, fiquei curioso sobre como são feitas as análises de tinta em casos de falsificações de obras de arte. Com base nessas indagações, apresento a seguir algumas das coisas que descobri. Em 2011, Wolfgang Beltracchi foi sentenciado a muitos anos de prisão, na Alemanha, por forjar o estilo de pintura em uma grande coleção de obras e com as assinaturas de grandes artistas como Picasso e Monet. As pinturas desses mestres valem milhões de dólares, de modo que vender imitações bem elaboradas pode ser um negócio muito lucrativo, embora gravemente ilegal. Beltracchi era um especialista em falsificar pinturas e tomava um enorme cuidado para fazer suas falsificações parecerem autênticas. Para isso, ele estudava meticulosamente os pintores que queria copiar visitando os museus onde os trabalhos estavam expostos. Ele, inclusive, chegou a visitar as casas desses artistas para tentar captar algo relacionado à forma como pensavam. Beltracchi conseguia pintar tanto com a mão direita quanto com a mão esquerda, dependendo se o artista que ele estava copiando era destro ou canhoto. Não havia margem para errar sequer uma pincelada! Os rótulos falsos no verso das pinturas antigas eram fixados usando uma cola caseira feita de ossos e outros materiais naturais. Ele também tinha o cuidado de usar tintas existentes na época do artista, mas foi ali que cometeu um erro fatal. Certa feita, Beltracchi estava tentando copiar o estilo do artista Heinrich Campendouk (1889 - 1957), que usava o óxido de zinco para conseguir um pigmento branco. Beltracchi também usou o óxido de zinco em sua falsificação, mas não sabia que sua tinta havia sido fabricada e contaminada com traços de dióxido de titânio. Desta forma, uma simples análise química de um fragmento de tinta da obra falsificada expôs a fraude. Já livre, depois de ficar apenas quatro anos na prisão, Beltracchi foi perguntado por um repórter se ele poderia garantir que jamais voltaria a falsificar. Rindo, ele respondeu que uma coisa era certa: não usaria tinta com titânio novamente! Para ser bem-sucedido, um falsificador deve ser como um verdadeiro artista e reproduzir pinturas boas o suficiente para enganar os especialistas – o que exige um pouco de genialidade. O falsificador também se depara com o problema de vender a obra falsificada. Isso geralmente envolve a criação de uma falsa “origem” (um histórico antecedente) da pintura. O plano de Beltracchi era o seguinte: ele agia com a colaboração de duas netas de Werner Yaeger, um rico industrial da época. Essas mulheres mentiam e alegavam ter herdado as pinturas de seu avô, que, por sua vez, as comprara de um notório comerciante de arte, Alfred Flechtheim. Rótulos falsos com o nome de Flechtheim eram colados no verso das pinturas. Um especialista em arte altamente respeitado, Werner Spies, foi enganado por toda essa informação falsa e emitiu certificados de autenticidade que facilitaram a venda das pinturas. Em outro caso, em 1962, o falsificador pintou uma imagem que afirmou ser a criação de um artista famoso do início daquele século. Após uma minuciosa análise, um investigador de arte encontrou uma única fibra de polipropileno grudada na tinta. Ocorre que aquele tipo de fibra não havia sido comercialmente disponibilizado para o público até 1958. Caso encerrado. A falsificação existe há séculos. Em 1496, Michelangelo (da famosa Basílica de São Pedro, no Vaticano) esculpiu em mármore a estátua de um cupido dormindo, quebrou-a parcialmente, enterrou-a para que parecesse antiga e a vendeu como uma antiguidade. No início dos anos 1900, os comerciantes de arte testavam a autenticidade de uma pintura esfregando álcool na tinta e depois perfurando-a com uma agulha quente. Tinta nova pode ser perfurada muito mais facilmente do que tinta mais antiga. Alguns falsificadores, sabendo de tal teste, misturavam baquelite – um plástico rígido – na tinta. Outras artimanhas incluem o uso de um processo especial de aquecimento em forno para simular o desenho de finas rachaduras (craquelure), presentes nas pinturas dos antigos mestres. No entanto, os especialistas conseguem perceber a diferença entre as rachaduras artificiais, que são bastante uniformes na aparência, das rachaduras verdadeiras, que apresentam padrões irregulares. F614 foi o nome dado a um autorretrato de Vincent van Gogh que foi levado a Marie-Claude Corbeil, uma química do Instituto Canadense de Conservação, para autenticação por meio de raios-X. Com base nas cartas escritas por van Gogh, sabia-se que ele usava uma tela “assimétrica” para pintar seus quadros, ou seja, a quantidade de fios horizontais do tecido da tela era diferente da quantidade de fios verticais. Embora os fios não bloqueiem os raios-X, sua tela era coberta por um primer (uma camada de fundo pintada inicialmente na tela para torná-la mais lisa). Essa camada, visível aos raios-X, é mais espessa nos vãos entre os fios do que nas partes em que os fios se sobrepõem. Deste modo, os raios-X detectaram que a trama de fios tinha números idênticos em ambas as direções. Logo, o F614 era falso. A espectroscopia ultravioleta e infravermelha, a absorção atômica e a microscopia são usadas para detectar falsificações de arte. Vale a pena contar o caso de Ely Sakhai. Ele comprava pinturas pouco conhecidas de artistas famosos, fazia uma cópia e depois vendia ambas as obras. Ele costumava vender as obras falsificadas na Ásia e as pinturas originais em Nova York ou Londres. O esquema rendeu 3,5 milhões de dólares, de acordo com o FBI. Para o azar de Sakhai, certa vez, o proprietário de uma de suas pinturas falsas em Tóquio e o proprietário da pintura autêntica em Nova York resolveram vender as obras ao mesmo tempo e na mesma casa de leilão. Por causa dessa improvável coincidência, a carreira do Sr. Sakhai foi inevitavelmente arruinada. Encerro este ensaio com um último falsificador: Mark Landis. Ele chegava em um museu ou igreja e se apresentava como padre Arthur Scott. Ele encarnava o personagem, vestindo roupas pretas, um colar clerical e um broche jesuíta na batina. O propósito da visita era doar uma pequena pintura habilmente forjada em memória de uma mãe ou um parente qualquer. Quem não aceitaria tal presente? Afinal de contas, o doador parecia alguém confiável, a pintura parecia autêntica e, melhor de tudo, era de graça. Mais de quarenta museus foram abordados por Landis, e muitos deles exibiram as pinturas como obras autênticas. Landis, obviamente, não aplicava o golpe apenas por dinheiro. Aparentemente, ele ficava satisfeito apenas ao ver sua arte aceita como autêntica. Ainda não está claro se ele infringiu alguma lei. De qualquer forma, quando as pinturas foram finalmente descobertas como falsas, os museus foram alertados e o departamento do FBI de combate ao crime de arte foi colocado no caso. Entretanto, Mark Landis desapareceu de repente e sequer chegou a ser preso. Como muitos falsificadores, ele era uma pessoa que queria apenas uma pequena aceitação do público. E ele se deleitava com a incompetência dos chamados especialistas que consideravam seu trabalho como originário dos nossos grandes mestres. Há quem prefira que ele nunca seja pego.